Last week we said that if we think the Bible is about us we will tend to read it like a rulebook – what we must do to please God. BUT if we see that the Bible is about God (and His glory) we will tend to read it and see what He has already done for us, through the gift of Christ’s sacrifice. 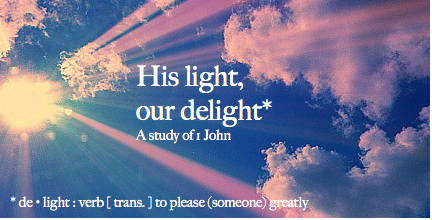 This latter perspective is how to best interpret our passage for today – in the light of what Jesus Christ has already accomplished (His light, truly is our delight!). What does it mean to abide in Him (2:28; 3:5 [in Him]; 3:9 [His seed abides])? What does it mean to practice righteousness (2:29; 3:7, 10)? Again, depending if we think the Bible is about us (and what we should do) – or if the Bible is about God (and what He has done), we will interpret and apply these two concepts in two VERY different ways. John 15:1-11: “I am the true vine, and My Father is the vinedresser. 2 Every branch in Me that does not bear fruit, He takes away; and every branch that bears fruit, He prunes it so that it may bear more fruit. 3 You are already clean because of the word [logos], which I have spoken to you. 4 Abide in Me, and I in you. As the branch cannot bear fruit of itself unless it abides in the vine, so neither can you unless you abide in Me. 5 I am the vine, you are the branches; he who abides in Me and I in him, he bears much fruit, for apart from Me you can do no-thing [of eternal significance]. 6 If anyone does not abide in Me, he is thrown away as a branch and dries up; and they gather them, and cast them into the fire and they are burned. 7 If you abide in Me, and My words abide in you, ask whatever you wish, and it will be done for you. 8 My Father is glorified by this, that you bear much fruit, and so prove to be My disciples. 9 Just as the Father has loved Me, I have also loved you; abide in My love. 10 If you keep My commandments [The Great Commandments], you will abide in My love; just as I have kept My Father’s commandments and abide in His love. 11 These things I have spoken to you so that My joy may be in you, and that your joy may be made full”(emphasis added). Simply stated, the words “abide in [Me] Him” simplify the teachings of Jesus into three words. The foundation of our joy and confidence is not what we do, but rather what God has done for us. So Jesus says in Jn 15 – I AM the true Vine…You are the branches. We are called to be branches, receiving and sharing in His nature; receiving and sharing in his very life — bearing fruit. Severed, we are bound for the fire pyre, but united to Jesus we are capable of bearing lasting fruit. PRAYER is yearning for the life that produces fruit. See yourself as a branch… That’s prayer. All the resources that you and I need, that the world needs are in the True Vine. So many Christians, instead of accepting God’s invitation to enter His throne room, stand alone outside the door, uncertain and ashamed. Christ beckons them to His banqueting table and offers them a room in His house, but they foolishly give up the glory of the life He has offered. They come to Jesus as Redeemer but never go beyond the doorway to abide in Him and experience the unspeakable joy of dwelling with the King of Kings (Andrew Murray, Abide In Christ). Our primary calling is to be with God, to immerse ourselves in His immeasurable love, joy, and grace. Abiding means that we trust Jesus Christ to meet all of our needs and be all our treasure. Now, as we learn to abide in Christ the fruit is real change from the inside out. And doing what is right is an evidence, a signal, that something supernatural has happened to us. John calls it being born of God. Out of the Father’s free and boundless love he calls a person to be his child and then he causes this person to be born again. To abide in Jesus means to live in Jesus; to make Jesus the center of your life; to find our comfort and joy in Him. As we abide a basic dissatisfaction with sin will begin to seep deep within us. A growing hunger and thirst for the gospel of Jesus Christ will draw us into a deeper connection with the true Vine. There will be lapses where we seem quite content to continue in some specific sin, but then a word will be spoken, a loving gesture from a brother or sister will be performed, God’s Word will come alive, a pang of conscience will spring up within us, and the conviction of the Holy Spirit will become loud and clear. What John is saying in both his gospel as well as our passage today in 1 John 2-3 is that an active intentional follower of Jesus Christ – when confronted with sin, will respond with true confession and humble repentance and yield into a deeper cultivating resolve to abide in Jesus and to do what is right. Now let’s turn our attention to what it means to practice righteousness? Roms 5:15-19: But the free gift is not like the transgression. For if by the transgression of the one the many died, much more did the grace of God and the gift by the grace of the one Man, Jesus Christ, abound to the many. 16 The gift is not like that which came through the one who sinned; for on the one hand the judgment arose from one transgression resulting in condemnation, but on the other hand the free gift arose from many transgressions resulting in justification. 17 For if by the transgression of the one, death reigned through the one, much more those who receive the abundance of grace and of the gift of righteousness will reign in life through the One, Jesus Christ. **Here’s deal: If you think the Bible is about you, you will tend to view righteousness as right living. But this is not correct. Righteousness is the gift of right standing. Lambanō – a verb meaning to “actively lay hold of to take or receive,” to lay hold by aggressively accepting what is available (offered). Accept with initiative, emphasizes the volition (assertiveness) of the receiver. As we receive the gift of righteousness and surrender into abiding in Christ, we will begin to find that our lives will no longer be dominated by unrighteousness as we learn to trust the gospel to impute its finished work into us – and then through us. What we are talking about is the definition of obedience. The church has made “obedience” a “religious” word, not a biblical word. The primary activity of Christian obedience is for us to make room in our lives to hear God call us beloved. One theologian has explained that the Latin word from which our English word obedience is derived means “to hear.” So, an obedient life is a life that listens to God. Spiritual discipline, then, is the “effort to create some inner and outer space in our lives, where this [listening] can be practiced” (Making All Things New: 67). Figurative language for two similar concepts. The Spiritual Legacy of Henri Nouwen by Deirdre LaNoue p. 65.